Each bell is about 1 1/2" across -- not too big, not too small. 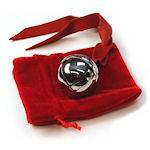 The bell has two throats (slits), a mirror-bright silver finish, and a gentle "alto" chiming sound. Sold per each. Limited quantity available. When they're gone, they're gone.